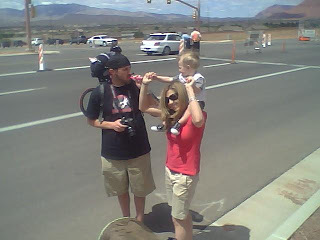 This last weekend I got to go volunteer at the St George Ironman. For those of you who may not know what the Ironman is, I'll tell you! It is the triathlon of all triathlons! It's a 2.4 mile swim, 112 mile bike, and a full marathon (26.2 miles)!! I know, crazy! 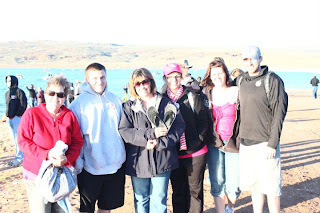 These people are amazing! My friend Heather has been training for it for the past year. She is amazing!! I was lucky enough to get picked to be a finish line volunteer from 8 p.m. until midnight. Heather's predicted finish time was around 9:30 or 10, so it was perfect! 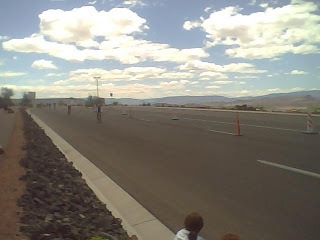 Since I didn't volunteer until later at night, I got to watch the whole swim, and then the bike transition. 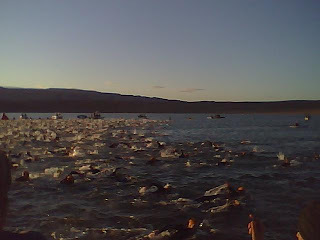 The swim was held at Sand Hollow Reservoir. The water temperature was only about 58 degrees....brrrr!! Then we headed down to watch her on the second loop of her bike, and the wind had picked up! And her brother Chad, his wife Jordan, and their baby Garrett. Chad was playing the Rocky theme on the kazoo! Very inspirational! 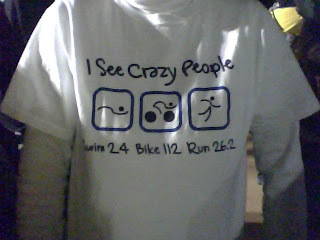 The best spectator shirt ever! And then it was time for a nap before I headed to the finish line. Another volunteer got this short video of Heather after she crossed the finish line (and me chasing her around). She was just smiling and giggling, so glad to be done! 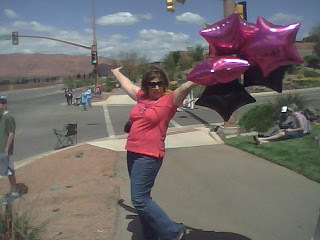 She completed 140 miles in 15 hours 8 minutes. She is absolutely amazing! From now on when I introduce her or talk about her, I am going to call her Ironman Heather! I am an idiot...she asks me my size and I look down at myself to try and figure it out...good grief. In my defense...I did just go 140.6 miles.